UPDATE: AutoDMG makes this process, "stupid easy" so I'm going to move away from the below to using that tool. Also, if you're master distribution point is a JDS you cannot compile configurations. Again AutoDMG to the rescue. Ever since Casper Admin has allowed for compiling configurations way back in the 10.5/6 days I have been successfully creating an OS.dmg via Casper Admin. I still use this method today & since 10.7 this DMG also includes the Restore Partition. The end result is an DMG of the OS that has never been booted & is an asr image. Much like DMG’s created by InstaDMG & AutoDMG. 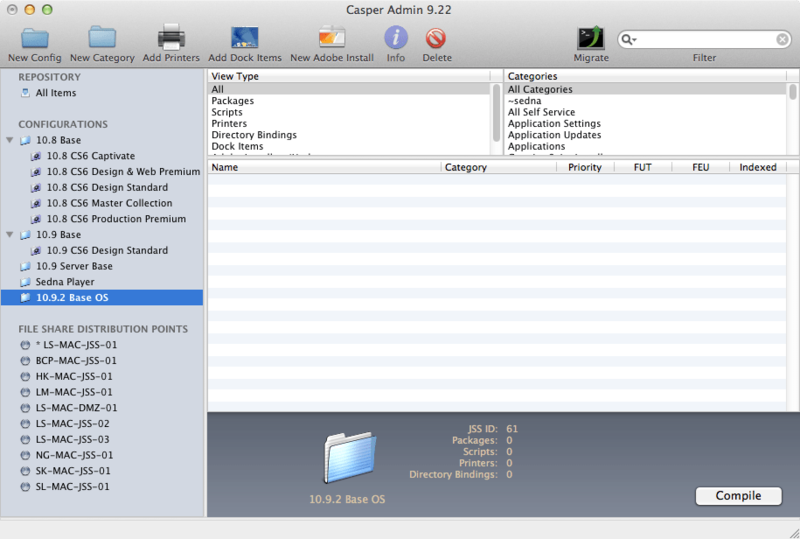 NOTE: The below example is when using Casper Admin v9.x & the "Install Mac OS Mavericks.app." The steps will be similar when using one of the new OS's delivered via the App Store. If using an older OS the method will be a little different... But I've sadly forgotten those steps. Also, the install app needs to support the Hardware/OS you'll be creating the OS.DMG on (so if the Build mac is on 10.9, then 10.8 will not install). It is advised that you perform the below actions on a Mac that is located on the same VLAN as the JSS, due to speed as you'll be installing the OS to a DMG across the network. Lastly, I've only ever performed the below using Mac OSX hosted JSS & DP's, with the CasperShare mounted via AFP. On your chosen Build Mac, download Mavericks from the App Store. 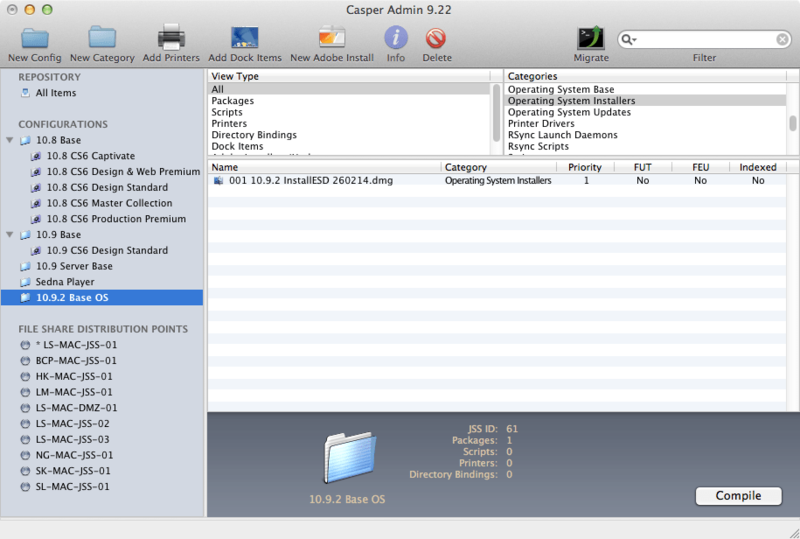 Once downloaded, open Casper Admin v9.x & drag the “Install Mac OS Mavericks.app” into the packages pane. With Casper Admin v9.x will copy over just the InstallESD.dmg within the .app bundle. 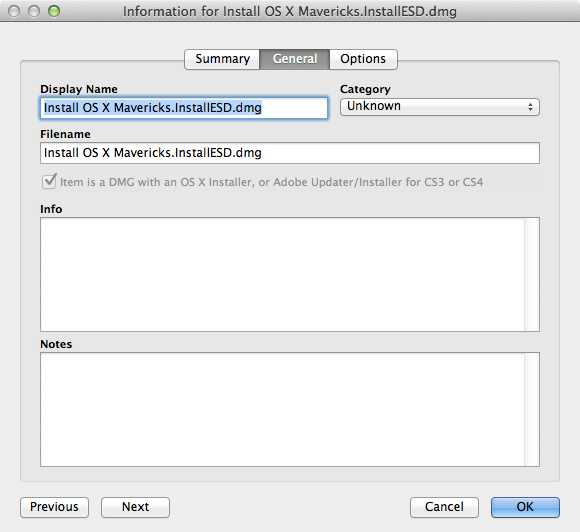 When using older version or Casper & maybe pre-Mavericks app bundles you may need to locate & copy the InstallESD.dmg from within the app bundle instead. Once copied, located the uploaded InstallESD.dmg & double click it to bring up the Information window. Once in the Information window, change the package priority to 1 & optionally rename the DMG. (I often rename the DMG something like: 001 10.9.2 InstallESD 260214.dmg. DO NOT tick requires restart. 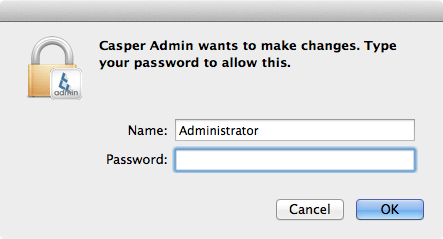 Create a standard configuration in Casper Admin. Next enter the Management account details, (these are required but the account is not created via this method). 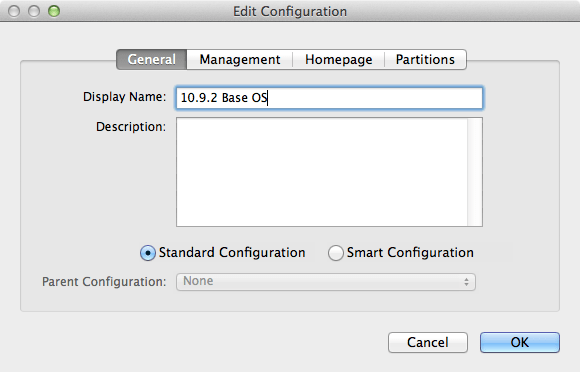 Drag the previously upload DMG into the Configuration. (If wanted, you could add other packages.. but i’d advise to create a Vanilla Base OS.dmg & to add the other packages to a configuration later). 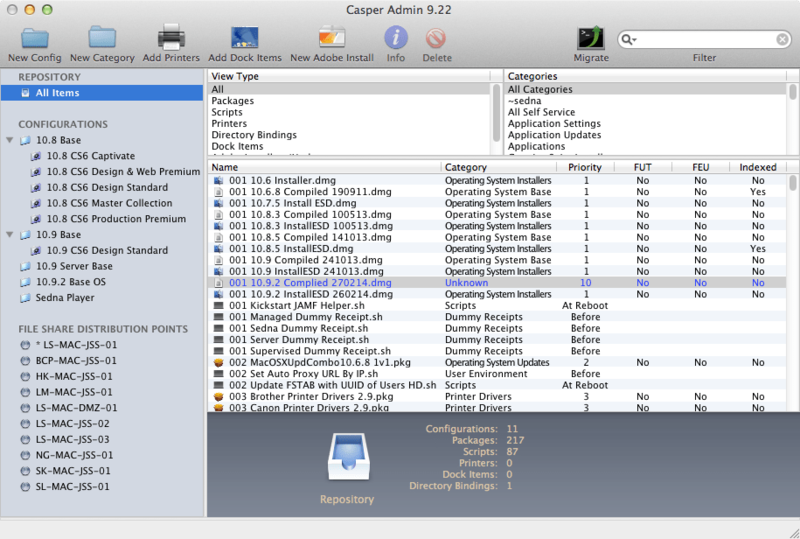 Once the DMG is in the Configuration, click the Compile button to the lower left of the Casper Admin window. At the “Create a compressed disk image?” prompt, read the wording & select the most prudent option for your deployment method. Casper Admin will prompt you to enter Administrator credentials twice during this process, & one more time per additional package you add. This can be avoided by running Casper Admin as root. 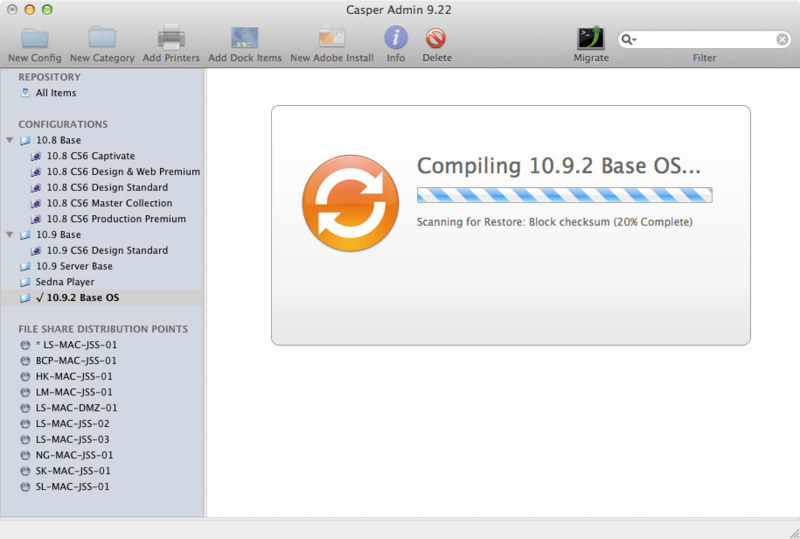 Once the compiling is completed, the image is then scanned for restore. When the compiling is completed, you should be returned to the packages pane. 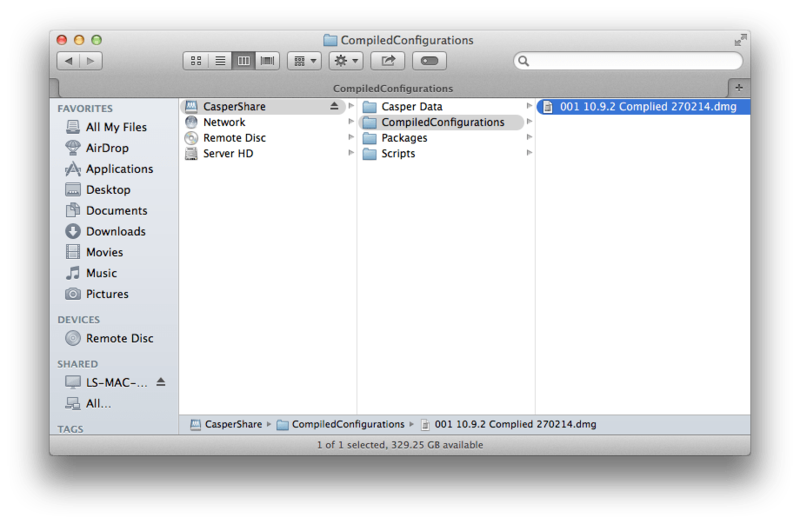 With Casper Admin open, navigate to /CasperShare/CompiliedConfigurations/ & drag the compiled dmg into the packages folder. You can also rename the DMG if wanted at this stage too. Quit Casper Admin & relaunch, the dmg should then appear in the packages pane as unknown. Double click the dmg, & in the information window change the package priority to 1. That’s it. The DMG is now ready to be used as your OS.dmg in your configurations as per your setup. For me, as you can see in the above screen shots, we have a 10.9 Base Standard Configuration & Smart Configurations under that. Whenever we create a new OS.dmg we replace the previous version with the newly created. I hope someone else finds this useful. If you use the Casper Suite & only need an vanilla OS.dmg, i’d suggest giving this ago. Of course, there is still nothing stopping you using InstaDMG & AutoDMG (& intact in a few situations they work better). But you can’t have too many options! This doesn’t affect the ability to use the Recovery Partition to boot into, nor does it affect the MDM lock or wipe functions. Also, Casper Imaging resizes the DMG when imaging as appropriate. But the Recovery Partition stays at 650MB. However, I’ve not attempted FileVault2 with multiple partitions as I understand this will only encrypt the OS partition & as our Users data is on a second partition.. there is little point to me using it. As far as I know, FV2 in Mav can encrypt multiple partitions. I could be very wrong here though, as we keep things simple with the one partition. You can have multiple encrypted partitions. However, if your user folder is stored on a non-boot encrypted partition, the tricky bit is getting the non-boot partition unlocked in time for you to log in at the login window. I’ve heard that some folks accomplish this by putting the unlock credentials in the System keychain. That said, I have not tested this and cannot attest to how well it works. Apple’s design model for FileVault 2 is where the user folders are stored on the encrypted boot partition. Thanks Rich. If I have to play with it, I’ll report back. 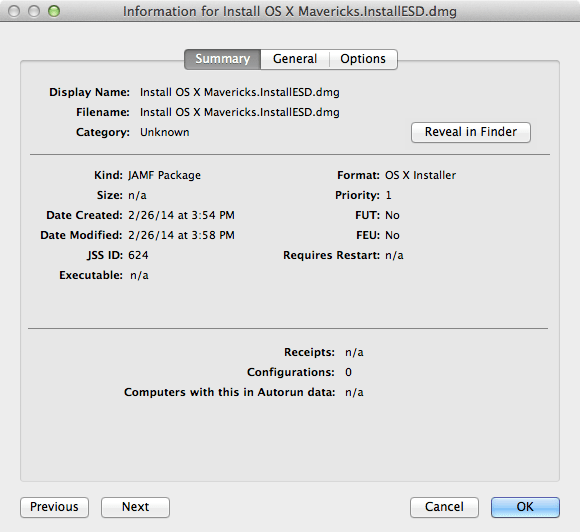 I’m getting a permission problem when trying to upload the install OS X Mavericks file. Any ideas why i’m getting that? Do other files upload ok? Just to make sure, you’re wiping the HD.. then installing the OS.dmg via Casper Imaging.. (this should be being block copied when running imaging not after). Once run, the mac is then being restarted? If it boots again to recovery, can you select the local startup disk as the one you’ve installed 10.9.2 on? I did wipe the drive before. I’ve noticed that when i compile the install file it goes from 5.2GB to 246MB! While i like the compression rate, i’m pretty sure that’s where my problem is. Is you Master Casper share a JDS? 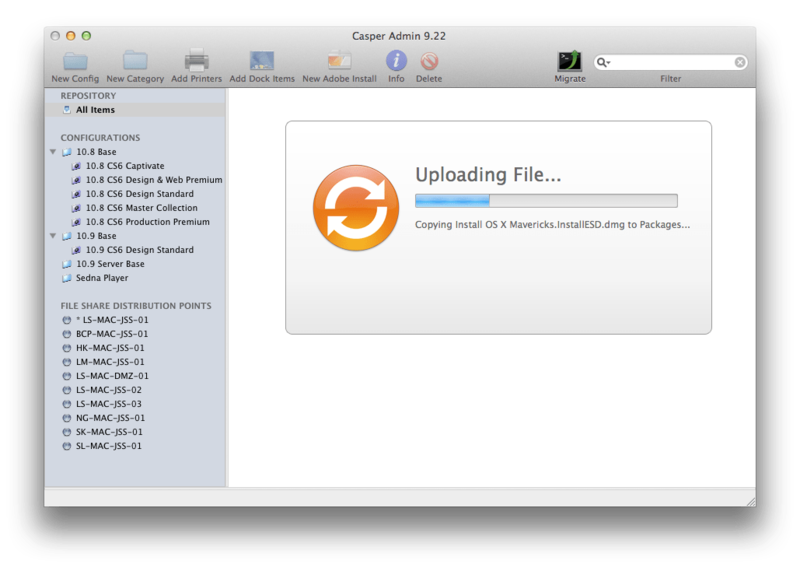 I’ve tested this out using an OS.dmg created with AutoDMG and deploying using Casper Imaging 9.3. All works fine except anything deployed under the ‘Prepare First Run script’ does not seem to be getting run. So no scripts, user accounts or Directory binding is being run on first boot. Odd, have you any packages that are set to install at boot volume during imaging? Also, post imaging.. What does the jamf.log say? Jamf.log indicates that everything has run correctly. When testing, any packages set to install during imaging would not install, nothing showed in the log why. I’ve been working the issue from home all weekend and think I’ve figured it out. If there is no local account, the First run script doesn’t run – or fails – I can’t tell because there is no account to log in with to see what has and hasn’t run. It’s quite annoying that the first run script isn’t logged anywhere. I think this is the only reason our manually built images were having more success. What I have now runs like: OS.dmg deployed > First run script to create temp local account, call a few jamf triggers (calls policies for settings/create desired admin support account/install additional minor software) and run the jamfhelper to lock the screen > larger software installs deployed on boot drive after imaging > logs into temp local account where the called jamf triggers finish > local temp account gets deleted > final reboot. I’ll recreate this at work tomorrow with added steps to pull any available updates off our NetSUS and bind to AD – if this works then that makes our entire imaging process modular and updating images becomes a 10 minute process as opposed to having to build images and then spend days testing to make sure we haven’t forgotten something. Wait, your not creating the management account via Casper Imaging? * Imaging that was just the OS and AD binding, no binding, no management account. 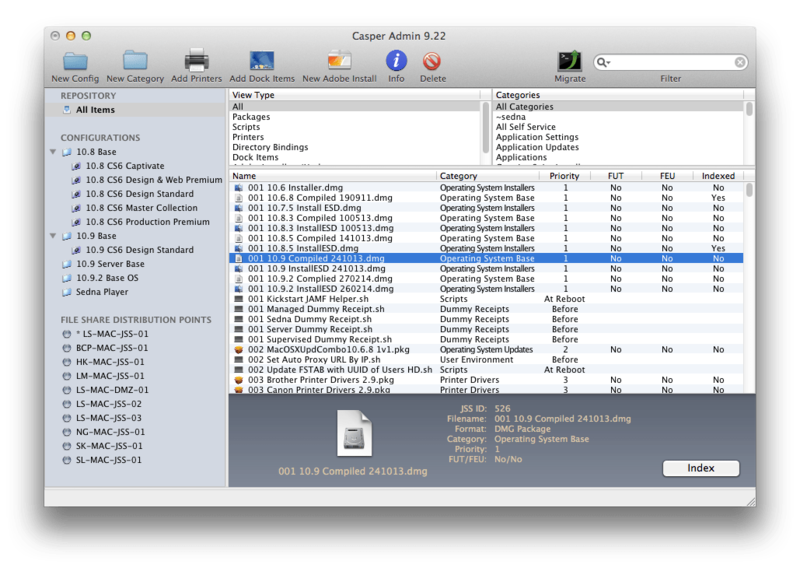 Are you using the same version of Casper Imaging as your JSS? I.e 9.31 JSS & Casper Imaging 9.31? Yes, same version of Casper Imaging as the JSS so it wasn’t that. 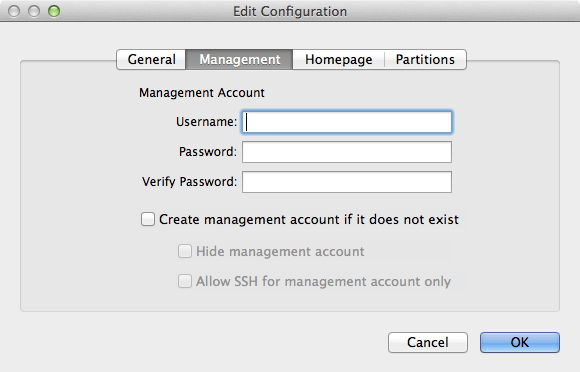 Have since created a new OS.dmg and the management account is being created every time now. Odd but I’m not going to question it. Have made a bit of progress but I’m hitting a few new walls which stem from not having a local account already baked into a manually built image. This builds the machine in the way I want but there is a few gotchas. If there is no local account created before step 4, the first run script does not run. If you add a single package set to install on boot after imaging it creates the Adobe installer account and everything runs beautifully, all applied policies fire off in the right order and it even reboots when it finishes so the first time you see a login prompt you know everything is good to go. This is the outcome I’m aiming for. However, I don’t want to have to deploy a package that installs on boot after imaging just to trigger that functionality, it feels hacky and adds an unnecessary link in the chain. I only want that FirstRun script running after reboot to keep everything as modular as possible so this is easy for other departments to adopt for their own needs. Where I am at as of today is I’m using ‘createuserpkg’ to add that user during the initial imaging. If I create the user with no autologin and everything fires off but it sits at the login screen with no indication anything is happening. You have to look at the policy logs for the machine to know when everything is completed. On reboot we’re at a ready to go state. If I create the user to auto login you see a bit of activity but again you have to check the logs to confirm everything is done. In both instances my script deletes this account. 1 Reboot. No matter whether by policy set to run last or set as the last line in the script, the machine always reboots early and ends up getting stuck in a loop. It seems to call the reboot before all policies have finished running. If I could figure out how to get it to reboot only when everything is complete then I’d have everything working. It’s late but I’ve just thought that maybe a ‘while postinstall.sh exists do nothing else reboot’ statement in my scripts might do it? 2. Lock the screen during imaging. I know things have changed in Mavericks and you can’t call the jamf helper app to lock the screen over the login window anymore. I’ve tried every suggestion I can find on jamf nation but I just can’t make this bit work, not even it is called as a LaunchDaemon. If I could get this happening then that’s everything. If I can’t get it to run then having the temp user autologin and then run the jamf helper is probably the next best thing. I found this page as am having permission issues with the ‘built-in’ local admin account not having access to it’s home directory when trying to create a never booted OS X image using casper admin and AutoDMG. I though I’d attempt to follow you instructions on using casper admin to create my never booted OS.dmg as apposed to AotoDMG but the Compile button is greyed out for me once I’ve added the INSTALLESD.dmg to a base configuration. Upgrade of my jds binary version to match the JSS & casper suite perhaps? I will try and test this tomorrow but would be interested to know if anyone else has seen this behaviour? You cannot compile on a JDS master. 🙁 https://jamfnation.jamfsoftware.com/discussion.html?id=9252. We’ve been using AutoDMG with our local admin account created on via our configuration (specified in Casper Admin, imaging done via Casper Imaging). Thanks for the quick reply and the link, good to know that it’s not supported! I’m still having issues with the permissions on the built in local account for my never booted os dmg. Basically it looks like the administrator account does’t have read or write permissions to it’s own home directory. I’m thinking of adding a script via casper admin into my configuration to apply the correct permissions to the administrator home directory after the administrator user has been created. We’ll I tried twice to create the OS image and both times the test system to be imaged KP’d after imaging with it. I can create the image step-by-step just fine. Not really worried as I use AutoDMG but was testing an issue we found that AutoDMG images are taking a very long time to create the management account after imaging using Casper Imaging. I have been working with support and he mentioned he is also seeing issues as well. Anyway, I was trying the method above to do further testing as I don’t like the suggested method from JAMF to install a fresh copy onto a system, target mode it, and use Composer to capture it. We have found that it cases issues with software updates on hardware that is not the same as the original system. I don’t want to create an image for each type of system either. As an aside the info on your site is excellent. It is one of my main go to’s to check out along with Der Flounder and a couple of others. Yea AutoDMG is an awesome tool, hence me no longer using this method.